As the weather warms up in Florida, I am even more committed to looking and feeling my best for those days at the pool and the beach. At the same time, it is very important for me to offer my children delicious, healthy snacks. I am excited to let you know that I have found the perfect solution with the Chi Bar™ which is the perfect snack for my entire family! 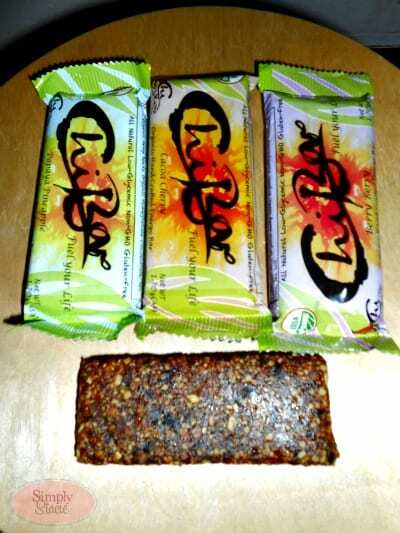 Chi Bar™ is an all-natural, organic bar that is packed with delicious fruits, seeds, nuts and nutrient dense whole foods. How does it taste? It is absolutely delicious and my kids actually request it for their afternoon snack. I love that I have a snack that I can feel proud to serve my family and it is perfect for busy moms on the go. Best of all Chi Bar™ is non-GMO, gluten free, low glycemic and soy and dairy free! My favorite Chi Bar™ is the Cacoa Cherry which is an organic energy bar that is hand crafted from the highest quality ingredients such as organic almonds, organic pumpkin seeds, organic banana chips, organic Goji berries, fig paste, organic black cherries, organic hemp seeds and organic cacao nibs. I appreciate that it is sweetened with a touch of organic agave nectar and fruit concentrates instead of processed sugars. It is not overly sweet and is very satiating thanks to the 4 grams of fiber and 6 grams of protein. It is not packed with sodium (only 65 mg) and the entire bar is 210 calories so it is great as a snack or as a light meal. The Papaya Pineapple Chi Bar™ is my children ‘s favorite and it is such a decadent, healthier snack with Omega 3 fatty acids, antioxidants, potassium for those extremely hot Florida summer activities, amino acids and complex carbohydrates to provide extra fuel for the body. This also includes premium organic ingredients such as organic papaya, organic pineapple and organic pomegranate concentrate. This Chi Bar™ is packed with the taste of juicy tropical fruits with the perfect blend of sweet and tart…..delicious! My husband loves the Berry Berry Chi Bar™ which includes his favorite power house foods i.e. organic blueberries, organic goji berries and organic cranberries. He tosses these into his lunch box for a mid-morning treat and will enjoy another one in the evening pre-workout. Finally, the Mango Ginger Chi Bar™ is bursting with the taste of ripe mangos and the spice of fresh ginger. It has a delightful chewiness and it is full of flavor…..this is my favorite to enjoy while sitting on the beach enjoying the fresh air and without any of the guilt associated with eating junk food. You are invited to visit the Chi Bar™ to learn more and purchase your favorite flavor(s). I just noticed that you can score a case of 12 bars on sale for only $33.00 (SRP $35.88)! I like how they have healthy fats through the seeds which I know help with cravings, help keep weight down somewhat, and help protect brain cells. Berry and/or nut and chocolate would be a favorite flavor. I wold most like to try the Cacoa Cherry Organic Energy Bar. I would most like to try the Cacao Cherry flavor. It’s nice that they’re kosher. I’d like to try the Cacoa Cherry Organic Energy Bar the most. Mango Ginger would be my Chi Bar of choice! I would love to try the Cacoa Cherry Flavor, thanks! I want to try the Mango Ginger. The Mango Ginger Organic Energy Bar sounds yummy! Each ChiBar™ is formulated to balance, heal and revitalize your body. I learned that this product is not available in the eastern part of the US! 🙁 And ALL the bars look delicious. Thanks. I would like to try the mango ginger organic energy bar. I want to try Berry Berry. I’d like to try the Cacoa Cherry Organic Energy Bar. the flavor i want to try the most is the mango ginger, it sounds really good to me! I LOVE that theses bars are a source of energy and vegan! I would love to try the Papaya Pineapple Organic Energy Bar! I would love to try the Cacoa Cherry Organic Energy Bar. I would love to try the Berry berry Organic Energy Bar. Thank you for the opportunity to win. Mango-Ginger bars look great. I am diabetic so this looks like a good product!! Mango Ginger Organic Energy Bar sounds yummy!